Below is an image of the HSZ6T-TBL trinocular stereo zoom microscope. Stereo zoom microscopes provide a zoom range of magnifications usually somewhere in the range of around 10x - 40x. The particular microscope shown below provides 6.7x - 45x without any added auxiliary lenses. Trinocular port - The trinocular port is provided to attach a microscope camera or a digital SLR camera. A microscope camera is typically added to the trinocular port by attaching a c-mount adapter (a lens with threads on it) and then the microscope camera is threaded onto the c-mount adapter. Some microscopes have a c-mount adapter built into the trinocular port. 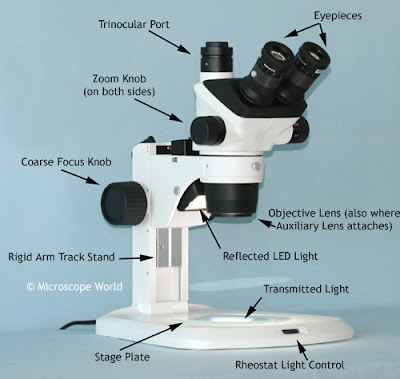 Eyepieces - Typically stereo microscopes utilize 10x eyepieces, although 15x and 20x are usually available. The eyepieces are where the user looks in order to view their magnified object. Objective Lens / Auxiliary Lens - Total magnification in a stereo microscope comes from the combination of eyepiece magnification and objective lens magnification (and if in use, the auxiliary lens). For example, on this particular stereo microscope the objective lens has a range of .67 - 4.5, which when combined with 10x eyepieces provides magnification of 6.7x-45x. Auxiliary lenses can be used to increase the magnification or change the working distance. Working Distance - The working distance is the amount of room required between the top of the object and the bottom of the objective lens in order for the image to be in focus. On the microscope shown about the working distance is 110mm. If you were trying to view a very large object under this microscope and could not maintain 110mm between the top of the object and the bottom of the objective lens, the item would not be able to be in focus. Reflected Light - The reflected light shines down from above and illuminates the specimen. This light can be angled to cast light on different parts of the object being viewed. Transmitted Light - Transmitted light shines up from beneath the stage and often is turned off when using the stereo microscope. Many items viewed under the stereo microscope do not allow light to pass through them, therefore some stereo microscope stands do not even provide a transmitted light. Rheostat Control - The rheostat control allows the light to be adjusted for brightness. Stage Plate - Typically a stereo microscope is provided with two stage plates - a glass stage plate and a black/white reversible contrast plate. Track Stand - A track stand has a rigid arm and allows for adjustment of the head up and down. Coarse Focus - The focusing knob allows the microscope to be adjusted for the proper distance between the specimen and the objective lenses, providing a crisp, clear image. If very high magnification is being used, a fine focus knob is also usually desirable. Zoom Knob - The stereo zoom knob increases or decreases magnification depending on which way it is adjusted. Some stereo microscopes have click-stops on the zoom knob. A click stop allows the user to know exactly what magnification they are at. This becomes especially helpful when using a reticle to make precise measurements.